Allan Chernoff, former CNN and CNBC senior correspondent, is an award-winning writer, speaker and CEO of Chernoff Communications, a strategic corporate and financial communications firm. He is the recipient of six best reporting awards from the Society of Professional Journalists' New York chapter, two National Headliner Awards, two New York Festival Awards, and was a reporter on teams winning a DuPont Award and three Peabody Awards. His writing has appeared in numerous publications including The New York Times, The Wall Street Journal, Financial Times, Los Angeles Times, Fortune, The Forward, Newsweek, and Money. 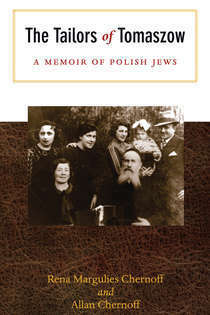 Allan’s book, The Tailors of Tomaszow, co-written with his mother Rena Margulies Chernoff, is a communal memoir and history of the survivors of Tomaszow-Mazowiecki, Poland. Rena Margulies Chernoff is among the youngest survivors of the Holocaust. She was six when the Nazis invaded her hometown of Tomaszow-Mazowiecki, Poland, ten when she toiled in the Blizyn slave labor camp, and eleven when she stood behind the barbed wire of Auschwitz-Birkenau. Eventually she emigrated to the United States, earned a master’s degree and became a teacher.